This page has information on computer/laptop recommendations, Printing, E-Mail setup, the BCT email lists, and Calendars. We have a separate page for software. Read everything on this page carefully at least at the beginning of your studies! Check out IT’s support center site or call 545-9400. While not absolutely necessary, getting your own computer (usually a laptop) is often a good idea for your time at UMass. Most software needed for classes and research in BCT is typically either available in an IT computer classroom or in one of the computer classrooms in the Design Building (room 260 or 235). You typically don’t even need to budget any money for software purchases, UMass has many site licenses available and other programs are typically free for students. However, having your own computer allows you to keep your files in a private location and makes you less dependent on computer room availability. Graduate students in ECO/BCT are always strongly encouraged to have their own computer when they begin their studies. The following sections give you some tips if you decide to purchase your own computer. You can nowadays choose either a Mac-, Windows- or even Linux-based (e.g. Chromebook or Ubuntu) system. While some software is only available for Windows (e.g. some CAD/BIM software), you can run it on a Mac or Ubuntu using what is called a virtual machine or Bootcamp. If you purchase a Mac, consider installing Bootcamp immediately so that you can install a Windows partition. This allows you to install Windows-only software on a Mac. For more on Bootcamp, go here. Set up at least 30-50 GB for the Windows partition. Once Bootcamp is up and running, go to this IT software webpage to get a free or low-cost copy of Windows. An alternative approach is installing virtual-machine software like Parallels but performance is usually less than with Bootcamp. Since RAM and Harddisks are cheap these days, go with a system with as high specs as you can afford. Minimum RAM is 4 GB and HDs should not be smaller than 500 GB. Choose a solid-state disk (SSD) if you have the option/budget. Choose a CPU with as many cores as you can afford. Quad-core is the minimum these days. CPU speed is not as crucial but the higher the better usually. The graphics card is only crucial for CAD and some video applications (or for gaming, of course). A good rule of thumb is that a gaming-optimized computer typically works well for CAD applications. Better to stay away from “embedded video” (e.g. Intel) graphics cards and look for names like NVIDIA, ATI and the like instead. Some software manufacturers have specific recommendations, e.g. Autodesk. If you are considering a Chromebook or similar hardware, keep in mind that while they are cheap and work well for office applications, they usually don’t allow you to install either Windows or Mac software. You can often get operating system software, office applications, anti-virus and more for free from the IT website. UMass has a variety of contracts that you should check before you purchase any software. For what is not listed there, check the U-Store or online academic retailers like Studica. For online data storage, don’t forget that you have access to the UMass Apps, Box, and the older UMass U-Drive system. Other options are Dropbox and OneDrive. If you have any software- or hardware-related question, check IT’s support site or call 545-9400 on campus. IT also has software and hardware walk-in support in the Lederle LGRC Lowrise building. Install antivirus software! Either go with the built-in options (e.g. MS Security Essentials) or download one for free from the IT website. Back up your computer and your data regularly! Immediately after purchasing your new computer, think about setting up a backup system. You will thank yourself once your data gets lost or stolen. Common approaches are external hard-disks or online backup services like Backblaze. Get a lock! Buy a laptop lock so that you can easily lock your computer to a solid object if you are in a computer lab or even in your dorm room. Most computer thieves “swipe” computers and will be deterred by a cable lock. If you occasionally use USB drives (e.g. for computer-room classes), write your name on it! You would not believe how many of these are lost. Printing is available in the Design Building in room 260A (right behind the computer lab 260). You can print to the b/w printer or the color printer at sizes of 8.5 x 11 or 11 x 17. After sending a print job to the printers, go to room 260A and release it using your uCard. You will be charged similar to other uCard print stations at UMass. It is important to have your UMass email (Google Mail via UMass Apps) set up correctly as it is used for all important announcements and communication between the university and you (e.g. for class emails from your instructors). If you don’t know about your UMass email address, find out more here and here. 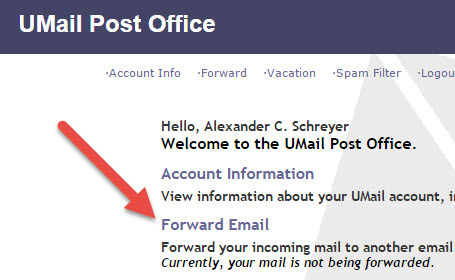 If you don’t use your UMass email as your primary email address (for example, if you have a personal GMail or Yahoo account), then you need to set up forwarding on your UMass email account to send all incoming mail to your personal account. Otherwise you will miss important announcements. Follow these steps to set it up. If you are still using the legacy UMail service, then you can set up forwarding in the UMail Post Office. Instead of forwarding you can also configure your UMass email as an additional account in your email app. We now have quite a few ways for you, our BCT students, to keep in touch with the BCT program and receive news, announcements, job offers etc. You can also connect with BCT alumni via our LinkedIn group. So “click”, “like” or “link” with us in any of these ways. You can also find us on Facebook, LinkedIn, and Twitter now! The best way to stay up-to-date with events and calendars is to subscribe to a calendar’s (ICS) feed. Those are automatically updated when the calendar publisher adds or changes any events. You can usually do that with any current calendar application (e.g. Google Calendar, Outlook etc.). Look for the option to “add by URL” or “subscribe to internet calendars” or the like. Often, all you need to do is click a link to an ICS feed on the device on which you want to subscribe to a calendar. For the BCT calendar and the various others that we include on our calendar page, go to that page and filter the categories you want to subscribe to (you can filter multiple or select none to include all of them). Then look for the “Subscribe” button below the calendar and add our calendar to your own (as shown below). The BCT calendar includes the UMass Academic Calendar. If you only need that one, filter using the “UMASS” category or check out OIT’s help documentation on the subject.